No matter what type of vacation you’re planning, our large group cabin rentals in Pigeon Forge TN are guaranteed to suit your needs. Are you working on planning a unique family reunion? Our cabins are big enough to comfortably sleep all the grandparents, aunts, uncles, cousins and grandkids! Are you trying to plan a special trip for the youth group at your church? Our large cabins have all the fun things, like pool tables and theater rooms, that will keep the kids entertained all through the weekend. And if you’ve been searching for the perfect place to say “I Do” to the one you love, our beautiful mountain homes make the perfect place to have the wedding of your dreams! Not only are our large group cabin rentals in Pigeon Forge TN perfect for every type of vacation, but they’re also only a short drive away from all the most popular Smoky Mountain attractions! There are dozens of exciting attractions to keep everyone in your group having a blast during your weekend in the mountains. Ripley’s Aquarium of the Smokies, where you’ll learn all about life under the sea, is one of the best aquariums in the south and one of the only places where you’ll have the chance to pet a stingray! Dollywood is easily the area’s best known attraction, showcasing family friendly theater, exciting roller coasters, delicious country cooking and the best mountain views around! These are only 2 of the dozens of fun Smoky Mountain attractions that will make your weekend away a non-stop blast! Why choose us? Because unlike overpopulated hotels and boring condos, we guarantee you a personalized, custom vacation experience when you stay in our large group cabin rentals in Pigeon Forge TN. When you choose to stay with us, we assign your group with a professional vacation specialist who will be available to answer any questions and help you make the most of your time in the Smoky Mountains. If you have questions about your cabin or need advice on the best places to eat, your specialist will be happy to help you have the best vacation ever! You won’t believe all the amazing amenities that you’ll get to enjoy during your stay in our large group cabin rentals in Pigeon Forge TN. 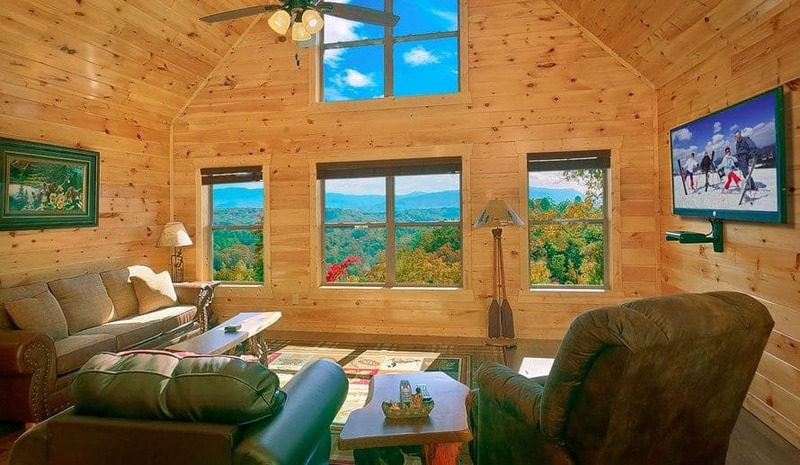 All of our cabins are thoughtfully designed, beautifully decorated and decked out with all the things you’ll need for a fun weekend in the Smokies! Hold a billiards competition, take a swim in the indoor and outdoor pools, soak away your stress in the bubbling hot tub and prepare a delicious meal for your group in the fully equipped kitchen. Every moment of your Smoky Mountain vacation will be wonderful when you spend it in our Pigeon Forge TN cabins! Now that you’re convinced that a Smoky Mountain vacation in the fall is what you’ve been needing, book one of our large group cabin rentals in Pigeon Forge TN today!